I Saved Three Cents Per Gallon At Speedway And I Have No Idea Why!!!! I went to fill up at Speedway the other day. The local Speedway is right on the way home, they typically have the best prices in the area, and we participate in the Speedy Rewards program where we currently have enough points for around $20-25 worth of Speedway ‘bucks’ that we can cash in. The price on the roadside sign as well as the pump indicated that I’d be paying $3.429 per gallon. I swiped my Speedway rewards card, and it processed the card as normal and I was them prompted for my credit card. I pulled out my Citi Dividends Master Card, which is how we pay for all of our gas, and was ready to swipe, when I remembered that I had my new linked Citi Dividends American Express card. I thought, “Hey, I might as well get an extra 0.2% cash back.” Which probably would work out to $0.07 but I figured, better in my pocket than the credit card company! I wasn’t sure if I could swipe the American Express card or not. The pumps didn’t have stickers (that I could see) with what cards they took. I began to panic because, if you don’t swipe a card within a certain period of time, it will assume you’re paying in the station. For some reason, I hate going in to the station to pay, so I figured ‘Here goes nothing’ and swiped the American Express card. I waited and it worked. Then I looked down and I saw that the price was now $3.399 per gallon. Three cents cheaper. As I pumped the gas, I looked around to see if there was any promotion that would explain this unexpected windfall. 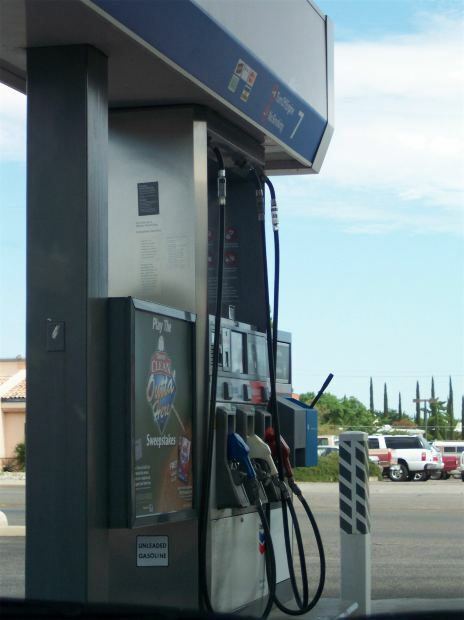 In the past, Speedway has had periods where they offer a few pennies per gallon off if you use your Rewards card, but they would have this information displayed on the marquee sign next to the entrance as well as around the pumps. There was nothing. I thought ‘Ah, maybe the station is lowering their prices’, but as soon as I finished pumping and completed the transaction, the price returned to $3.429. The next day I went to the website and looked around. No information about any discount for rewards member or for using a particular credit card (the only possibility I thought of was because I was using AmEx versus MasterCard). I even Googled it to see if anything would come up on the Gas Buddy forums or somewhere else. I’m not complaining that I saved money. I think it worked out to an extra $0.37 or so, so it’s not a life changing amount, but it’s still kind of cool. It just drives me crazy that I don’t know why! The never ending battle of high energy costs versus a warm home this winter can have a person ready to move to warmer climes. However, don’t despair, as there are options and they don’t include wearing a sweater to bed. A few quick and simple tricks can save you hundreds of dollars this winter on your heating bills and you will still be warm and toasty. Lower the thermostat and raise the humidity. Increasing the humidity of the home will not raise the temperature but will make a lower ambient temperature feel warmer. They say it is not the heat; it is the humidity. Well, that is in fact true. Higher humidity levels make the feel like temperature of a home warmer. Installing a whole house humidifier can be a time consuming and sometimes costly expenditure. Simple room humidifiers can be used in a pinch, along with alternative no cost humidity raising methods. Purchase two or three energy efficient large room humidifiers such as for a child’s sick room. Create a space for the humidifier where excess moisture will not condense on wooded surfaces. Following the manufacturer’s instruction, turn it on. No cost methods include allowing steam from showers to escape into the rest of the home and adding tea kettles or pots filled with water to the tops of wood burning stoves. Small bowls or pails filled with water can be placed near heat registers for forced air systems. Time and lower your thermostat to reduce energy consumption in non-peak hours. Do not run your heating system at normal occupancy temperatures during late evening hours while family members are fast asleep, or while off to school or work. Invest in a programmable thermostat and set the temperatures lower by 10-15 degrees at night or when the family is not present. Additionally, lower the overall temperature of the home by five degrees. The change is relatively imperceptible but the cost savings is justifiable. Comparison shop for the cheapest gas and electricity prices from other suppliers. Heating oil prices can vary not only from supplier to supplier but also from season to season. Consider budgeting for your winter heating requirements through the summer when heating oil prices are down. Look into payment plans, scheduled delivery and discount programs for large deliveries. Comparison shop for electricity as well. Deregulation has created an entire new industry of independent energy suppliers. Investigate these options in your area. Planning for a cold winter should take place months in advance, not with the first frost. Being prepared is half the battle. If lowering the temperature in the overall house is a bit much for young children, seniors or those households with exotic pets, conduct an energy audit. Determine where your heat is going. It isn’t enough to search out the cheapest energy in your area, if you are going to allow your savings to leak out of the house every time you turn the heat on. Check windows, doors, basements and attics for possible heat losses. Use a candle check for drafts around windows and doors and correct with new weather stripping or storm coverings as needed. The minor cost of weather proofing your home is usually paid back in the first heating season and often in the first one or two months. Taking the time to increase humidity, installing programmable thermostats, comparing heating fuel costs and conducting an energy audit can save an average family of four living in a 1,500 square foot, single family home over $300 during the first winter. That saving will continue to rack up each season with minimal upkeep. Checking windows and doors twice a year, along with managing home temperatures based on season, will not only keep the home warmer in winter, but cooler in summer. Which scenario bothers you more? a) You need gas. You delay your gas purchase for awhile, only to have it go up. b) You get gas. You later watch prices fall. In both cases, you missed getting gas at a cheaper rate than you paid. Option (a) enrages me. Option (b) on the other hand, just makes me shrug my shoulders and barely give it a second thought. In other words, once I’ve spent the money, what happens afterward doesn’t affect me (option b), which explains why it doesn’t bother me. But, option (a) bothers me because it’s money I haven’t spent yet, so I’m more sensitive to price changes. Which option bothers you the most? I can’t complain about my current commute to work. I live about two miles from work, so my daily commute back and forth is next to nothing, and as much as I complain about gas prices, working so close to home keeps my costs pretty low. The biggest reason is safety. Although I live really close, there’s a major six lane highway that runs through the area and cuts between my house and my office. There are two overpass options that I would have to choose from, and neither of them is safe enough for me to consider it. Both are two lanes with not much extra space on the side. I’ve seen people cross with bikes and on foot, but every time I see someone do that, I hold my breath and I know there’s no way that I could take that chance. But, this year they’re rebuilding one of the two bridges, and along with the rebuild, they’re adding a dedicated pedestrian crossing. ..and I could get some well deserved exercise too. There are many people I know that swear by Costco for the cheapest gas prices. I wish there was a way to make it work for us, but typically we don’t get too much gas from Costco. Location – There isn’t a Costco that’s very convenient to us. In fact, if you go to Costco’s website and choose a store locator, we’re almost smack dab in the middle of four stores. This gives us a nice selection of stores to choose from but that also means they’re all about eight miles away. Timing – We typically go to Costco once per month. We usually time our visits to match the coupons that we get in the mail, which rotate once per month or so. Often times, we will have enough gas in the car to where filling up isn’t necessary. Payback effect – My wife’s car is the one that would typically be a candidate to get gas at Costco. She drives an SUV that gets around 18 miles per gallon. Unless we’re driving past one or making a planned shopping trip, the ‘cost’ of getting gas would be about one gallon. With a twenty gallon fill-up, that means that (at current rates), we’d have to save about 17 cents per gallon to break even. Value of time – I’ve heard, especially recently, that this type of difference between nearby stations and Costco stations does often exist, with some family and friends reporting up to a 25 or 30 cent difference in pricing. But, on top of the cost savings, you have to factor in whether the 30-45 minute trip would be worth the additional savings. Maybe, but I’d rather spend the quality time with my family than spend that time in the car or away from my family. Chance -Even if Costco gas is cheaper, there’s no guarantee that it would be as cheap, even if you hopped in the car and drove to the station as soon as you heard of the variation in price. Just like anybody else, Costco can raise prices anytime, so you’d have to ask whether that 25 cents per gallon difference will still be there. Bottom line, if we had a Costco right down the street or if we drove past one on a regular basis, I’d be inclined to make more of our gas purchases there. As it is, it’s pretty rare. 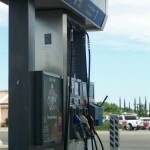 I think the one thing I will do is look to see if we can plan our fill-ups to coincide with our monthly shopping trips. Outside of that, I don’t see a way that really makes sense for us to utilize Costco’s gas stations. I was really nervous about our gas bill. The period for the last bill (early/mid-December to early/mid January) was cold. We had a lot of days where it didn’t get above 20 and the nighttime temperatures were in single digits. The furnace clicked on and off at a pretty rapid rate. Still, I was hopeful that the bill wouldn’t be too high because, prior to the heating season, I discovered and repaired a leak around the fan in our master bedroom that had been whisking air into the attic at what had to be a pretty alarming rate, since the leak was occurring at the highest point in our home. I know that the fix worked because our bedroom, which had been noticeably colder in the winter in years past, was now a more comfortable temperature. I think gas rates went up a lot between 2008 and 2009, and the increase last year was explained largely by the fact that it was the first year that we kept the temperature higher all day rather than dropping it down during the year, since my wife was now staying at home with our child. Still, this year’s cold temperature made me think it could be higher yet again. So, I was happily surprised when the bill turned out to be $227. We actually decreased our usage by about 5% from last year. This with what I know was one of the colder months we’ve had since we moved in. I would love to see that go down again next year. I’m hoping that new glass block windows in the basement and re-caulking around some of the windows (things I have on my 2011 to-do list) will continue to improve our energy efficiency.